On the eve of a gala concert in her native Alaska and just before leaving on her three country South American tour, Buenos Aires-based Jonathan Spencer Jones caught up with American mezzo-soprano, Vivica Genaux. What are some of the exciting things you are doing at the moment? We have a gala for a new company here in Fairbanks, Opera Fairbanks, which just got established a year or two ago. Until then we’d had an opera workshop and musical theatre and various things like that, but never a full opera company. They asked if I would participate in a gala for the 50th anniversary of Alaska’s statehood. So I’m doing a couple of pieces, right before I get on the plane for São Paulo. Then I have this tour in South America with Concerto Köln, which I’m so looking forward to. I made my debut with Concerto Köln about 10 years ago, so it’s kind of our 10th anniversary tour. I made my debut at the Staatsopera in Berlin under René Jacobs performing Hasse’s Solimano and so the last piece on the program is also an aria from that opera. I thought it was appropriate because of the time we’ve been together and how we started off. After that I have a few days to recuperate at home outside of Venice, where I live with my husband, who is Italian. It is in a little town in the country, half an hour from the Dolomites, half an hour from the beach, so it’s a nice place to recuperate from a couple of busy months. Then I’m very excited to be doing a performance with Christophe Rousset and Les Talens Lyriques at the Festival of Saint-Denis, near Paris. I’m doing the cantata Il pianto di Maria by Handel and the Pergolesi Stabat Mater. Then I go immediately to Bamberg for performances of Haydn’s L’isola disabitata, which is my first Haydn opera. I’ve done Haydn chamber music before but never an opera, and I have two schedules for this year, L’isola disabitata and then in December, Il mondo della luna in Vienna with Maestro Harnoncourt. Also this year I’m adding Tancredi, also in Vienna with René Jacobs conducting. I have my debut at the BBC proms in August under Maestro Noseda performing Rossini. And I’m doing another Semiramide finally – I haven’t done a Semiramide in years, and I’m doing it with Will Crutchfield at the Caramoor Festival, which is a great festival in Katonah north of Manhattan. They do a lot of chamber music and a lot of off-the-road opera, semi staged or in concert form. 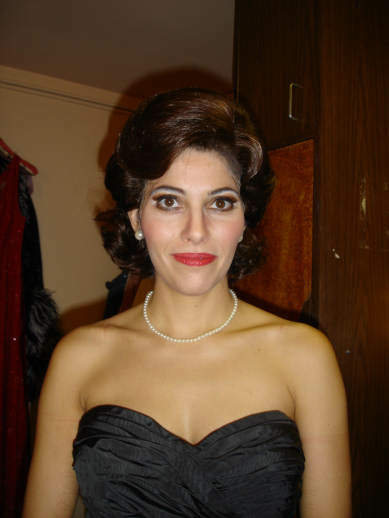 That festival has given me the chance of doing La gazza ladra, La donna del lago, Lucrezia Borgia – several operas that don’t get performed that regularly, at least in the States. How do you divide your time between opera and concert performances? It basically depends on what fits in my schedule. I like keeping a balance between the concert and opera performances. Until a couple of years ago I wasn’t asked to do too many concerts and now I guess my reputation has got to the point where I’m being asked to do more concert work, which is great and I enjoy it. The difference is in the concentration and energy level. For concerts you get there generally the day before, maybe two days before, and go straight into concert, so you have to be really prepared and ready to go when your feet touch the ground. With opera you can generally take a little bit more time, you have three or four weeks of rehearsal at least, so you can wallow around in the part, if it’s a new part at least, and figure out who you are in relation to other people. This will be my first Haydn so I’m sure the conductor will have some things to change in how I’ve approached Haydn. Everyone always has their own language, which is interesting to work with and neat to add to one’s repertoire and flexibility. So I enjoy both of them and I think I’d get really tired if I just had opera, opera, opera, opera, or if I had concert, concert, concert, concert to prepare. If you’re able to do a tour of the same concert it’s different but it’s also very challenging – because of the costs they try to get as many concert dates as possible within a limited timeframe and so you really have to be careful with keeping yourself rested, not talking, staying healthy and not getting sick on airplanes. Each one has their own challenges. 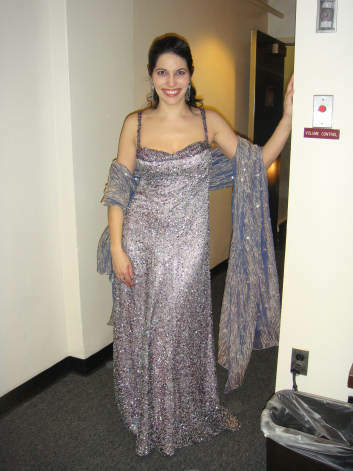 As Ino in New York City Opera’s 2006 production of Semele. What do you look for in a new role? I now know the range I’m looking for in a part. Also if I know I’m singing in a particular theatre, that gives me a little flexibility. If I know the theatre is huge then I might be a little bit more particular about the range, if I know it’s a smaller theatre I might accept to do something in a bit of a lower range. I don’t want to push the lower voice and want to make sure I’m heard over the orchestra. Also there is whether it’s a Baroque orchestra or a modern orchestra. There are a lot of different factors that I take into consideration. That said I’m generally pretty game to try something for once and see how it goes. That’s not always a good idea in a professional career because if it’s not the best thing for your voice or if it’s something people aren’t accustomed to hear you singing – my calling card is generally the coloratura work I do, so if I accept to do a piece that doesn’t have a lot of coloratura, I could have people coming and maybe disappointed I am not doing that. I remember when I was in college at Indiana University, I went to see Baryshnikov when he was involved in Mark Morris’s White Oak Dance Project and I thought it was fantastic the new language he was incorporating in his dance style but the audience was just so upset he wasn’t doing all the balletic stuff that he had been doing. They missed the point of the experiment and I remember that and try to keep it in my mind. But I think as an artist one has to invite the public to change and grow with them and share the growing process. It’s kind of a catch 22, you try it and find out later how it went from the other person’s perspective! Related to that is how you split your interest between the Baroque and bel canto repertoires? That’s very similar to the discussion between concert and opera performances. In the Baroque opera most often you have only solo arias and there are six to eight arias in one performance, they can be very long and it’s just you on stage half the time, so your energy level has to stand up to that. You have to create a storyline for yourself that makes a lot of sense. Then it’s less stressful keeping the concentration level by following an emotional path through the aria, if you have that already programmed in your head and you yourself are reliving the story. Whereas in the Rossini – other than the Baroque I do a little bit of Donizetti and very little Bellini also, but primarily it’s Rossini – there you have all the great duets and ensembles, so you get to be a good cast member and a good ensemble player and really work with people, and I love that also. So it keeps me balanced also. In Baroque what I really like is the interaction between the voice and the orchestra. The orchestra doesn’t just accompany but punctuates what you are saying as a singer, so you have the opportunity of really working closely with an orchestra. In Rossini generally the orchestral is purely an accompaniment rather than a participant. What recordings have you got in the pipeline? We’ve got a big one coming out, Ercole sul Termodonte by Vivaldi with Fabio Biondi. That’s got a big cast. I’ve got another big one, a solo one, also with Fabio Biondi, coming out I think in November this year. That’s called Pyrotechnics and it will be all Vivaldi arias. As the name implies it has a lot of hula hula but also pyrotechnics in the sense of using ornamentation to amplify the emotion, so it’s not always fast ornamentation but more delicate ornamentation also. I like the analogy of the fireworks with it and it’s a really good CD and we had a great time recording it. I love working with Europa Galante and they have such concentration and energy. We had some difficult situations in the recording, because the heat had gone out the night before we began. So Fabio and his wife went out and bought heaters and because it was the first time they had been used, when they were turned on they started smoking and smoking. So other than being freezing cold it was also toxic! By the time we got into the afternoon – the morning session was cancelled – it still smelt really horrible, but the orchestra agreed to do the recording and everybody was dressed up to their necks and I was in my big fur coat, breathing into the collar as much as possible, and we got two great arias recorded that afternoon. But I doubt anyone else would have accepted to work under conditions like that. I so respect them for their professionalism, and then of course the quality of the product they produce. And for me working with Fabio as a violinist is really neat, because there are such similarities between the voice and the violin. I always juxtapose it with my experiences working with René Jacobs, who is a singer. For me working with singers and violinists is a really special situation because I feel they really understand the concept that you can’t just go on forever on one breath – a vocalist understands obviously but a violinist has the limitation with the bow when they have to change direction. So I’m really looking forward to that CD coming out and we also have a series of concerts we’ll be doing together in presenting it later on. Why has it taken so long to get to South America? I was in Santiago de Chile, they invited me to do La Cenerentola there at their theatre, which was beautiful and I had a great time. I was engaged to come to Buenos Aires at one point but then Argentina had that economic decline and they didn’t take international singers for a while, so the economy has been a big part of why I haven’t been down there. I’m glad to see things are picking up a little bit and I’m really looking forward to coming down. Looking to the future, you haven’t done any Mozart? I’ve never done Mozart and I would really love to sometime. I was joking with René Jacobs that he has to do his some of his first Rossini with me and then I have to do my first Mozart with him, so we’ll see! I’m doing Tancredi with him now so we’ll see if he holds up on his end of the bargain! In the first 5, 8, 10, 15 years – I’m going into the 15th year of my career! – it was intentional because Mozart tends to treat what we say is a mezzo soprano more as a second soprano and I just wasn’t comfortable with the range. Also I don’t like the part of Dorabella (Cosi fan tutte) very much and I don’t like the part in Idomeneo that much, but I would like to do the part of Sesto in La clemenza di Tito and of course Cherubino (Le nozze de Figaro) I would like to try now that I have so many trouser roles in my rep. I hope still singing and on the stage. I always tell people when I was growing up in Alaska that my dream was to become a hermit and that is kind of what I’ve attained. Even though I have a frenetic performing schedule, I don’t do much other than that when I’m performing. I don’t see people, I don’t talk to people and any kind of communication is done through email – I’m pretty strict about that. The reason is my speaking voice tends to be the same range as I sing in and so it’s double duty and gets tired pretty easily. My main goal in life is to be doing this for as long as possible. I just enjoy it so much, I enjoy being up on stage, I enjoy working with orchestras, I enjoy leaning new rep, even though its challenging in the Baroque as well as the bel canto, because there is so much ornamentation going on. I have to say I am enjoying the new Haydn role because pretty much what you see is what you get, you don’t have that much ornamentation to add to it so wow, that is a breath of fresh air for me. I’ve never had goals in terms of roles. Between bel canto and Baroque I would like to keep it as evenly balanced as possible. Now the Baroque is really taking off and so a lot of times you find funding in Baroque where you don’t in bel canto. So to just keep on with projects I believe in. I’m so lucky now – part of my problem is saying no, as there are always really exciting projects with people that I really admire, who I’ve either worked with or want to work with. I try to keep myself every day working technically, I do my vocalises every day, try to keep my voice as even as possible, try to help it grow, so that when the opportunities come I am ready to take them and make the most of them and do the best I can.